It has been a high honor to have been commissioned to build this new pipe organ for Holy Family Catholic Parish. The worship space was built in the 1970s, and seats approximately 1,000 people. A small pipe organ served them faithfully until last year, when it had to be removed so that the space could be prepared for the new instrument. That organ has been refurbished, and is reliably serving another parish. 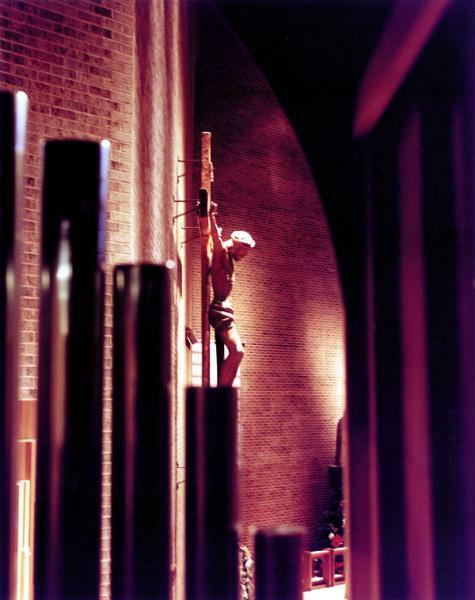 Holy Family’s organ committee was especially thrilled with the large organ we installed in 1999 at Glenview Community Church, in Glenview, Illinois. Hearing it, and the seamless crescendo of which all of our instruments are capable, captivated them. Let’s be honest about the uses of modern organs. They all need to lead congregational singing, all have to accompany choirs or ensembles, and all of them play a respectable variety of organ literature. But what is it about an individual organbuilder’s sound that makes one more successful at certain things than another? Someone once told me that our organs sound “familiar,” and that our organs conjured up images of his childhood church experiences. Our sound represents a personal evolution, inspired by the great organs of Hook, Johnson, Willis, and Harrison, and tempered by the organ reform movement’s lessons of classic design and scalings. Our instruments respond to their liturgical requirements by virtue of their warmth, nobility of tone, and inherent musicality. By means of their classic design and scalings, every period of organ literature can be responsibly and musically rendered. Perhaps this familiarity is a result of building in the mainstream of musical taste and style. But mainstream does not have to be synonymous with “vanilla.” First, in our organs there are no exact duplicates of tone color, even within the Diapason choruses. The flues and reeds each have their own color and character at every pitch level, carefully orchestrated so that all the pitches blend well into a full ensemble. Second, our musical sensibilities compel us to reinforce fundamental pitch. Mixtures are pitched, scaled, and voiced so that they offer clarity in the bass and reinforce the fundamental in the mid-range and treble. And we don’t shy away from 16′ manual pitches. 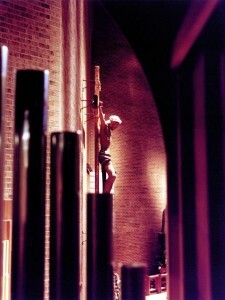 Third, the construction of the organ must facilitate the tonal results. The metal in our pipes is very thick; we use soldered mouths not only on large pipes, but those into the 4-foot range; reed resonators are either of wood, thick spotted metal, or thick copper for an en Chamade; all flue pipes up into the 4-foot octave, and reeds through the 2-foot octave, are supported by heavy felted scallop-traces. Slider chests are an essential component. The case and console of the Holy Family organ are made of white oak with walnut accents. The pipes in the facade are the low octaves of the Great 16′ Double Open Diapason, the Great 8′ First Open Diapason, the Great 8′ Second Open Diapason and the Pedal 8′ Principal. The wood pipes to the right of the case are the Pedal 16′ First Open Diapason. Special thanks to Mr. Bill Stein, the Director of Music at Holy Family Church, to the Organ Committee, and Monsignor Daniel Hermes for their vision of the new organ, and how important it can be in the context of contemporary Catholic worship. Thanks also to the staff of John-Paul Buzard Pipe Organ Builders, whose dedication, craft and artistry make these creations possible.